I have had so much fun designing these three Tulipfield Dresses (here is the first and the second of the group, in case you missed them). I can't believe how well the weather has cooperated with these, both colorwise (it has seemed irrevocably gray here for the past few weeks, with so many touches of pink, green, and yellow) and temperature-wise (it's been freezing and windy and rainy = not much going outside). This is pretty typical of Oregon springs, in my experience — spring seems to start in late February and go, sometimes, until June. So wooly, soft little jumpers like these can be worn, I think for several months — I pictured this one, especially, with cable tights (do they make dijon-mustard-colored cable tights?) over a soft, full little calico dress (I picked up this little pink calico dress for a song from Marshall's, but I think one with longer sleeves would be adorable). I used almost the same yoke pattern I used for my Cecily Baby Sweater (I just did it in half-double crochet and left out the openings for the ribbon), then did the body of the dress in wattle stitch, which is one of my favorite nubby, drapey sort of stitches. The whole thing is done in the round (again, with attached rows), so there are no seams; I crochet over all of my tails at the color switches, so there's almost nothing to weave in at the end. 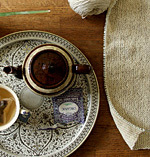 And again I used my new favorite yarn, the DK-weight undyed Eco Alpaca (I buy all of mine at Happy Knits). I think I have crocheted miles of this yarn now. Oh how I love alpaca yarn. Especially for crochet, which can tend to be rather heavy and stiff for wearable garments. Alpaca yarn seems to crochet up more beautifully than any yarn I have ever used. I plan to make all three of these dress patterns available in sizes from 6 months to 4T within the next few weeks. I have the drafts written, so if anyone is interested in testing any of them, I would love a couple of testers (especially for the bigger sizes) — just let me know in the comments and I'll get in touch with you. *Thank you testers!!! I think we have plenty now and I will be in touch directly!!! I seem to slowly be making progress on all of the things I had started last month. I have so many different patterns I want to make up for different projects, it's ridiculous. I need to stop starting things and start finishing them! I would love to test crochet this pattern if you still need them! Oh I'd love to test out the 4T! If you can't buy mustard cable tights I'm sure you can get it in cream and dye them mustard. I would be happy to test one of the patterns in a bigger size for you. I'm getting ready to spend 7-8 hours in the car this weekend, so I'll have a lot of time to crochet. Oh Alicia, I love these. I'd love to test one, but I've got to brush up on my crochet skills first. I've been mostly a knitter and not crocheted for awhile. I'm always looking for fun things to make for my little granddaughter, though, so I'm really going to have to get cracking on the crochet refresher! I've been adoring these dresses. I'm also willing to test the pattern if you're looking for people. I could use a break from my shawl! I would love to test crochet a 6 month one. I just LOVE these. I am absolutely squealing with delight. This is so beautiful! I would love to make an exact replica. The problem is that I don't know how to crochet. I've learned how to knit this winter, but I'm very slow. How would you rate the difficulty of this pattern? I hope its not too advanced. I will buy this pattern as soon as you post it !!!! Love it!! I can only do very, very simple crochet, but I want this so much in grown up size I might just have to learn more about crocheting so I can make one some day. Too cute, really! That outfit with the mustard tights -- how absolutely adorable for a little girl!! My heart fills with such joy when I see each new dress! Your dresses are really lovely; I just need to find a small someone to make them for. I would be willing to test s 3T. I'm a fairly experienced crocheter. You make such darling dresses, but think about making some shorter tunics/pants too. When babies get to the crawling stage, a dress gets caught under their knees! 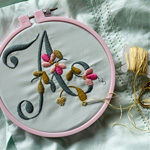 I really love the "wattle stitch". Need to figure out how to do that one. Love, love, love it! So sweet and pretty. oh my gosh i LOVE the layered look!!!! Would love to test 2T size. Oh I'll test for you if you still need someone. I have a 3 year old granddaughter so I could do a larger size one and a co-worker having a baby girl in the Fall or I could do a smaller one too. I'm a neighbor in Hillsboro and I do well with reading patterns. At any rate these dresses are rockin!!! Norma. I would LOVE to test-crochet any of these dresses. I have a heap of superwash wool yarn batting its eyelashes at me and four friends with baby girls who need dresses. I'd be happy with any size. THANKS! I would love to be a tester! I love to crochet and I have a four year old little girl who would love a dress like this! pick me, pick me!! If not, I can't wait to buy the pattern when it comes out. They are darling! Good Job! These dresses are so sweet. I love the colors that you have used. You wouldn't want me to be a tester. My crocheting skills are sadly lacking. It would probably turn out looking like a "bra" for a VW Beetle, not to mention that your daughter would probably be a senior in high school by the time I finished!